This was a great weekend trip to the Gores where I had been a couple times before but I had always been interested in Eagles Nest so I went with Sarah to give it a go. We met in Vail and we drove up to the Piney Lake Ranch in her car but we were stopped where a small tree was covering the road. I was appalled at how there was a line of like 10 cars and people walking around looking like fools wondering what to do. I got one small look at the tree and thought to myself this is ridiculous. I could have moved it on my own but I got out of the car, gathered everyone together and in a matter of seconds we moved the tree the road was clear again. I don't know how long people waited in their cars but with a line of 10 on a forest service road it may have been awhile. Once we were on our way again, we made it to the ranch and parked and quickly started up the Piney Creek Trail. We made good time as we gently ascended through beautiful aspen forests. We met the boot path that climbs steeply up towards Peak C which we took and since I had been there twice before I knew exactly where to go. The bushes and marsh wasn't as bad as I remembered but the very dry winter may have played a role in that. Soon enough we made it to the small lush basin just below Kneeknocker Pass where we set up the tent and relaxed for a bit while making some food. 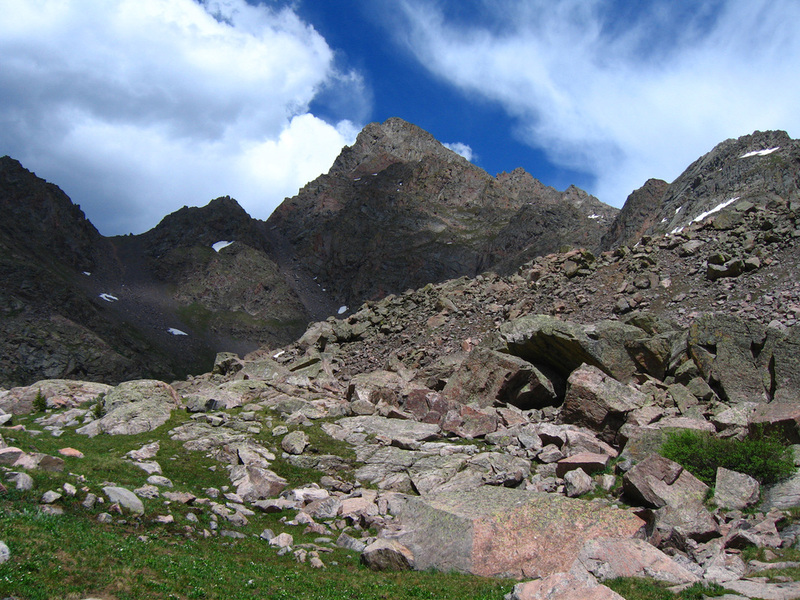 We made it a plan to climb Eagles Nest the next day and Peak C the day after. So we were off to sleep once it was just dark enough and around sunrise the next morning we were up and ready to go. We ascended gentle grass slopes to the north towards Game Pass which is the saddle between the Corner Peaks and Mount Powell. It was a beautiful morning and once at the pass, I saw into the Upper Cataract Creek Drainage once again and I had lots of memories of my previous Gore trip back in September of 2010. This time I knew right where to go to ascend Eagles Nest so we started down the other side and traversed further to the north than Josh and I did two years earlier. Once I saw more open slopes we began heading up. Most of the climb was only class 2 with a few class 3 moves thrown in for fun. 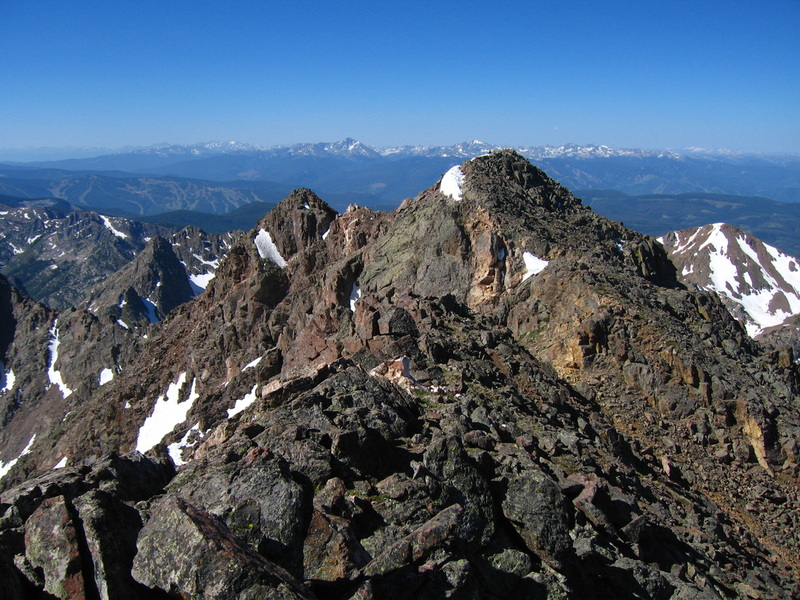 We soon crested the ridge and I got a good look at the towers that befuddled Josh and I before. 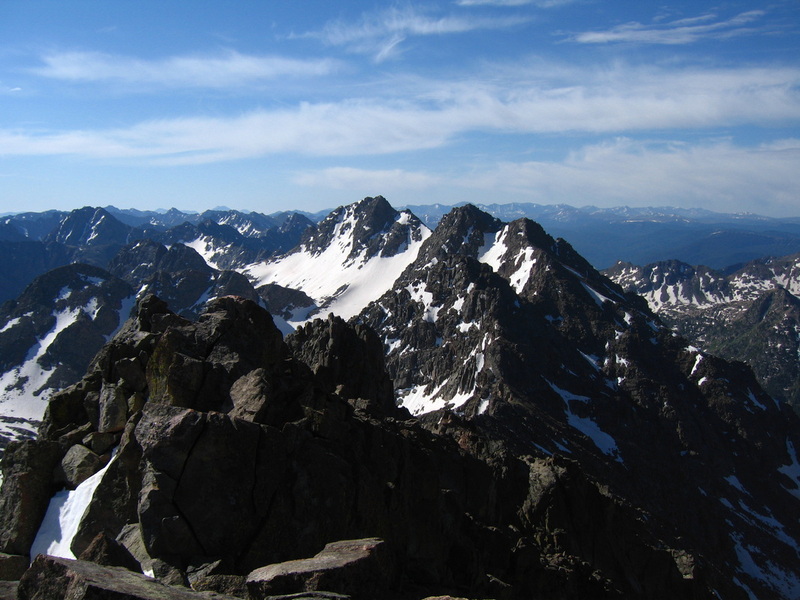 Those towers are the crux of the Powell/Eagles Nest traverse but we bypassed then this time around. 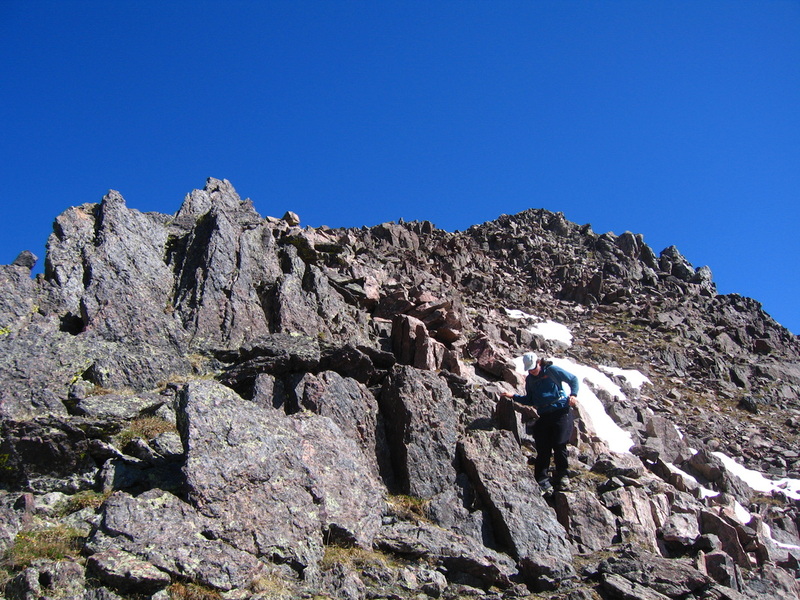 The final ridge walk to the summit of Eagles Nest was a fun scramble with a few class 3 spots. Once on the summit it was clear how little this place was visited. The register was an old Gatorade bottle with some paper and a pen inside. We were the first ones to sign in about a month and I recognized some familiar names. Views towards Kremmling, and to Mount Powell were all fantastic. 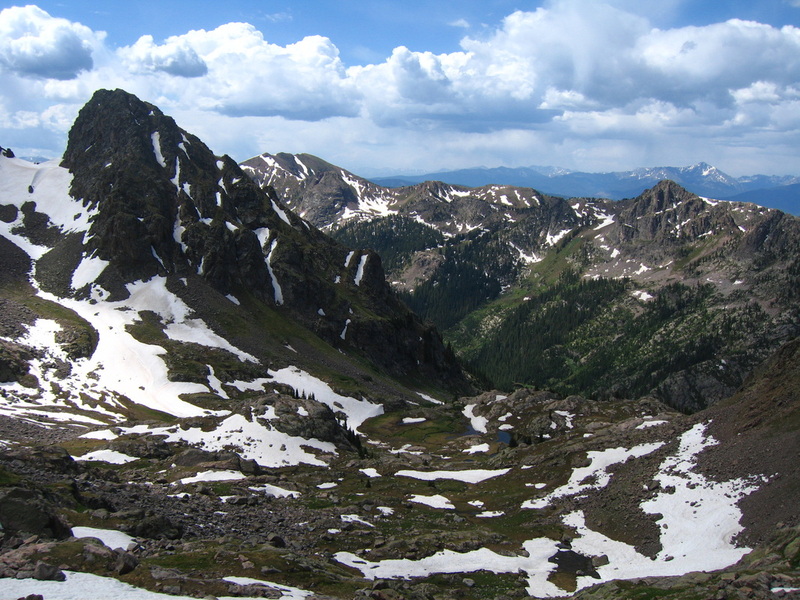 The alpine basins along the east side of Eagles Nest looked very remote, wild and difficult to get to. We basked in the glory of this unique, rarely visited Colorado summit for a half hour before retracing our steps back to camp. It was only about 1pm by the time we got back but with the building clouds we didn't want to take any chances so we simply relaxed the remainder of the day. We again went to bed at sunset, which was really late since it was almost the longest day of the year! The next morning we were up and were quickly heading up the steep snow and talus slope on the opposite side of camp. We didn't go up Kneeknocker Pass but instead up to a small notch in the west ridge of Peak C by using the gully to the right of the standard route up to Kneeknocker. This gully was about 45 degrees on average and had some nice firm snow we were able to boot up. Once we reached the notch we were able to see into the next drainage and look down the spine of Ripsaw Ridge. It was a beautiful sight. We made a left turn and began traversing along the south side of the ridge crest a ways until we reached the base of the summit block. Since I was only going off of a one sentence route description, I was a little unsure as to where the easiest way to the summit was. I noticed the SW couloir route off to the left where I also saw the saddle between peak C and Peak C Primce but for some reason I thought I had to veer left towards the ridge crest and we would find a way yo the northwest side of the summit block. After three attempts, each of which led to mid-5th class exposed climbing that I wasn't comfortable doing, Sarah and I went back around the summit area towards the south and found a nice gully leading above the cliffs. Once we were here the final couple hundred feet to the summit was an easy walk. From the top, the view down the north face was impressive and Powell was very dramatic just to the north. It was another warm morning so we relaxed here and took lots of photos. Looking down Ripsaw Ridge was beautiful and I was inspired to climb many more peaks in the area in the future. Peak D looked very nice. We descended back to camp which was a breeze now that we knew where to go but upon reaching the text, the damn marmots had it against our gear once again. After a brief torture fest and scaring them away we packed up and started hiking out. All I could say was whoever made that Piney Lake trail needed to be reprimanded for making it go up and down so much! Thank you Sarah for making this trip so great!